When you have a celebration and need to entertain the guests, please your precious guests with this exquisite chocolate covered marshmallows on a stick snack. 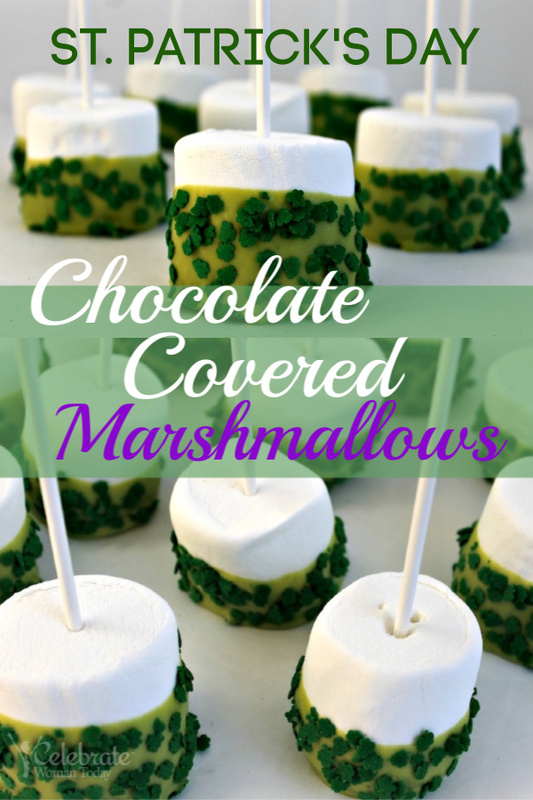 My kids love marshmallows, and we try to be creative and make our own chocolate covered marshmallows Easter eggs or marshmallow hearts for Valentine’s Day or green chocolate covered marshmallows for St. Patrick’s Day. If you are not in a hurry and want totally gluten free and vegan chocolate covered marshmallows for your celebration, do buy Dandies totally delicious and vegan marshmallows. If your local store doesn’t carry them, order on Amazon to be delivered to your door. For vegan dark chocolate, go to shop here. This link will take you to vegan white chocolate that is an excellent way to make your festive chocolate covered marshmallow dessert. Where Do Real Marshmallows Come From? The history of marshmallows is fascinating! The source of making delicious and real marshmallows is the sap from the Mallow Plant that loves wet and marshy environment. The sweet secret of the Mallow Plant was known to ancient Egyptians who prepared candied goodies mixed with nuts and honey for the their Gods and Pharaohs. Marshmallow delicacy took a new shape and form when the French chefs created a mixture that combined the recipe from the Egyptians and the added egg whites and sugar ingredients. These days, we incorporate marshmallows of many colors and shapes into many desserts. Use the well-known marshmallows you can buy in any stores for decor and festive occasions, and for picnics and scout trips. 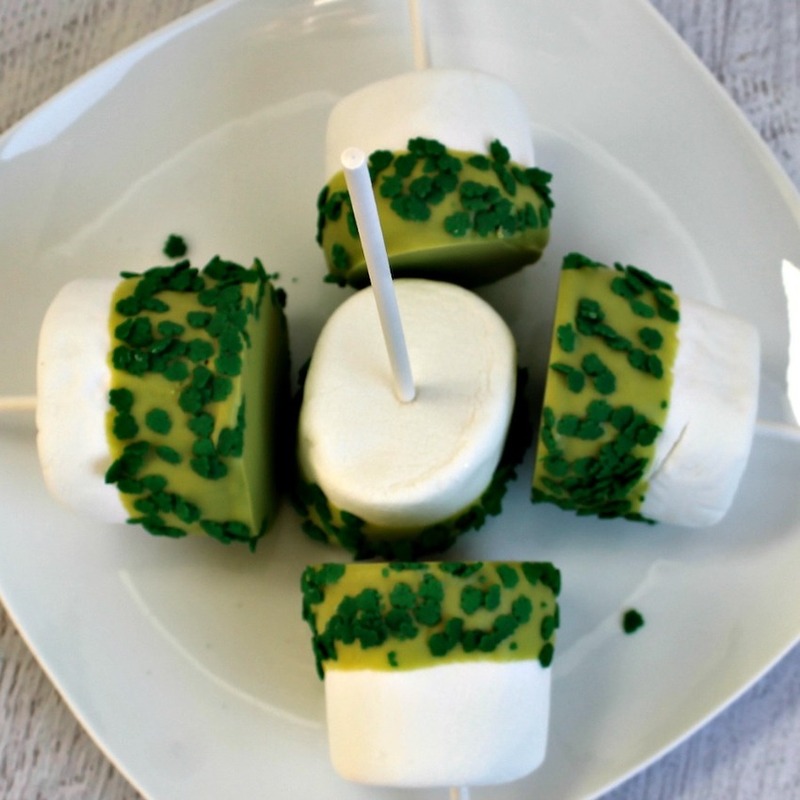 For this particular chocolate covered marshmallows, we took large marshmallows and turned them into a fun dessert for St. Patrick’s Day celebration. This recipe is easy to make and is not time-consuming. Your children can easily become patisserie chefs while practicing how to make chocolate covered marshmallow on a stick. What a great time to share, to laugh, and to indulge into a green Chocolate Covered Marshmallow dessert! Are Chocolate Covered Marshmallows High In Calories? The calories per serving or per one complex marshmallow differ from one recipe to another. You need to take into account not only the calories from a single white marshmallow base, but also from the chocolate and any embellishments each chocolate covered marshmallow may have. On average, one chocolate covered marshmallow could be anywhere from 100 to 120 calories. You can become an Egyptian cook for a few minutes and prepare some of your most delicious chocolate covered marshmallows on a stick ever! Your family will be grateful for them. Your guests would enjoy a simple treat that comes in a small size and with interesting flavors. Cover a large cutting board or cookie sheet with wax paper. Insert a stick into the top of each marshmallow. Dip the marshmallow ¼ of the way into the melted chocolate. Cover the sides of the marshmallow with sprinkles. Sprinkle over a plate or bowl to catch the loose sprinkles. Set on wax paper and repeat the process with the remaining marshmallows. Let harden for 2-3 hours at room temperature. What a cute idea! My kids would love these. I’m saving this for next year. We always bring treats for their St. Patty’s day party! These look like such a food option for a party. I am going to bring them to a get together tonight. It looks so easy to make! I will have to make this with my niece! Those are super cute and perfect for the St. Patrick Holiday season! You make it look so easy! Definitely cute and easy for a party. My kid loves everything marshmallows. He will love to make these treats for St. Patrick’s Day! I didn’t know the history of the marshmallow. Interesting. These are such a cute and easy idea. These are so cute and easy! I’ll have to make them! Fun idea for St. Patty day. My girls would love these, need to find the small shamrock sprinkles. Yum! They look delicious. I especially love how easy they are to make. My kids would love these. Yum!! I love chocolate covered marshmallows, but have never made them myself for some reason. How silly am I? I’m going to try this! 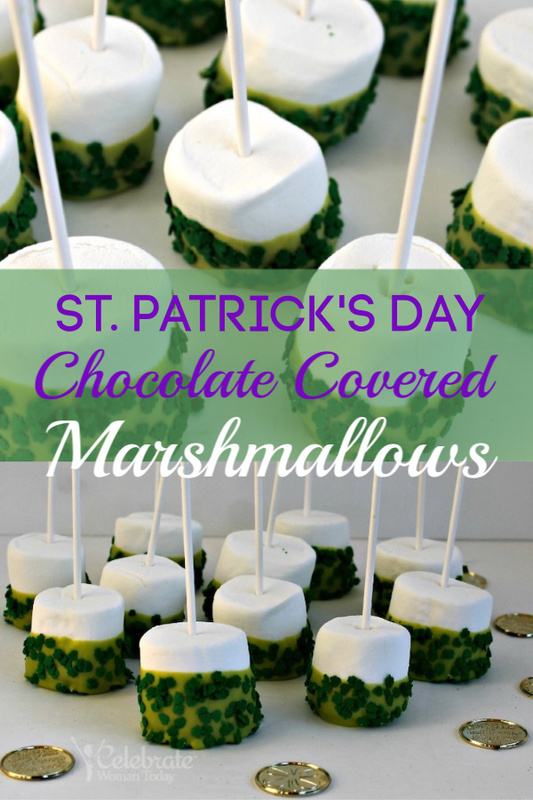 What a perfect treat for the kiddos on St Patrick’s day! I am sure my kids would be happy to have these as a snack. Something fun that I can do with the kids that everybody will love. Perfect celebration for St. Patrick’s Day. Those are super cute. What a great little treat to make for the holiday. Bonus points for being super easy! Adorable! I wish I had seen this earlier in the week. I have to pin it for next year. These are just so cute. Thank you for sharing. The kids would love them. These look neat, I will have to make them, thanks. They look so cute and so easy! They look good and easy, thanks. These are so cute and easy enough for my grandkids to make with me. These are so cute!! Such a simple but adorable treat!! My son would LOVE making these with me! !